A rollicking, moving songfest of fellowship bursts forth on the stage of Palm Beach Dramaworks inspired by the life, words and music of Woody Guthrie. 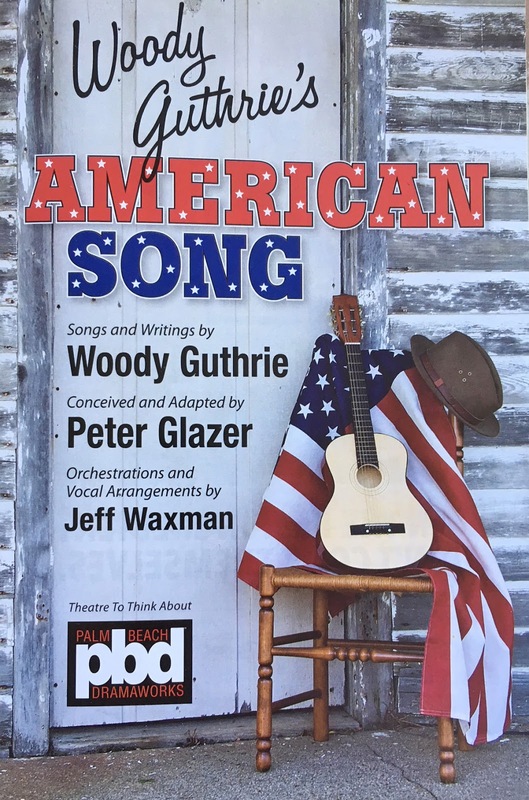 This high-energy production of Woody Guthrie’s American Song, as conceived by Peter Glazer, is particularly poignant and relevant to our times. Does history change to remain the same? Must there always be a disenfranchised faction of Americans? Woody Guthrie was first and foremost a poet of the people; ”people’s songs” as he called them, the aggrieved and the downtrodden, migrant workers, busted union members, and victims of income inequality by birth. They were our farmers, our steel workers, our coal miners, one might say the very builders of our great country, but victimized by bankers, politicians, the Great Depression, and, then the final blow, a severe drought that hit the Southern and Midwestern plains creating hoards of “Dust Bowl refugees.” It may be the dark side of the American Dream, but Woody had a dream of “A Better World” and the goodness of the man and his dream shines through. Guthrie presages such “peoples” performers as Bob Dylan, Bruce Springsteen, and most recently receiving the Woody Guthrie Prize, the rocker John Mellencamp. His spirit endures and this show preserves it. Peter Glazer’s musical was adapted entirely from Guthrie’s words and music. 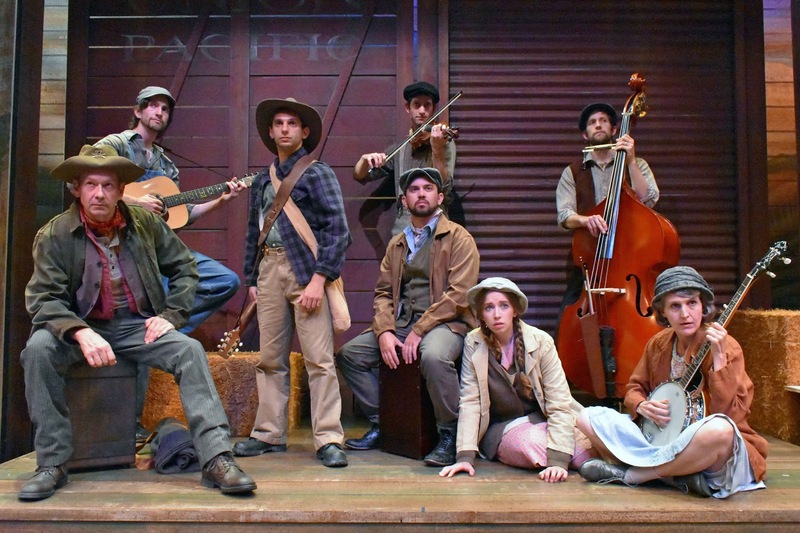 It features five gifted actors & singers who are backed by the musical ensemble of the three Lubben Brothers (local multi-talented musicians and singers), playing a number of instruments which amplify and elevate this memorable production. They serve as backup singers and musicians on most songs, giving this production a special inspirational quality at times and at others a downright knee slapping driving force. Glazer’s work is not a mere hootenanny; it is musical theatre. 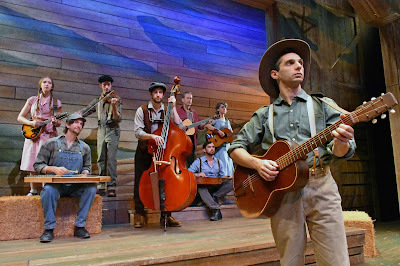 The “book” in musical parlance is about Guthrie at different stages of his life, and the turbulent times in which he lived, the Gibson guitar being handed off as a baton from one actor/singer to another. He thematically ties all these pieces together into a chronological narrative, a Prologue, On the Plains – the Early 1930s, A Train Heading West, The California Line, The Jungle Camp, New York City, Middle 1940s, and then an Epilogue. 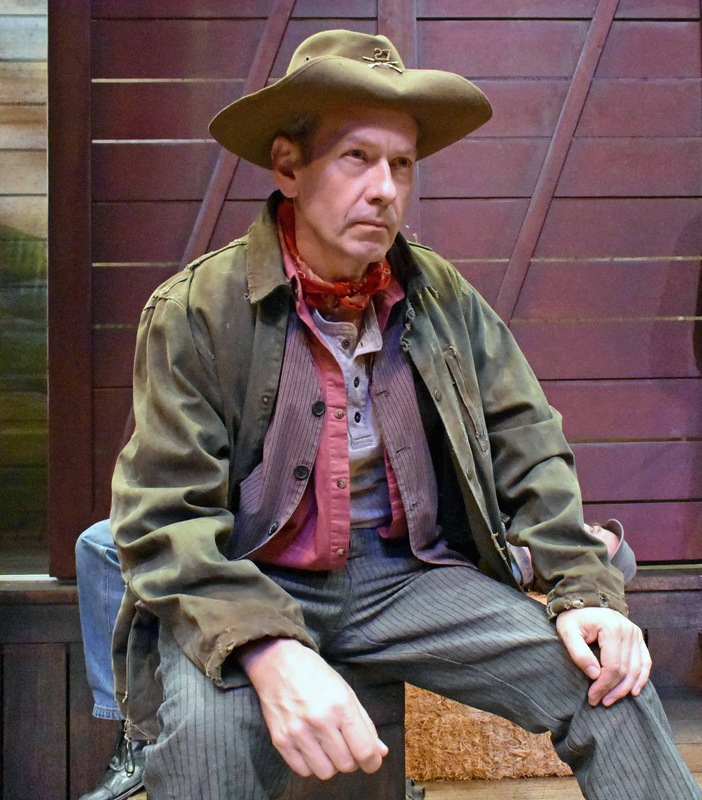 The actors start with the words of Woody, defining what it means to be a ballad singer: The ballad singer is a mystery to everybody except maybe his own self…. What heart of the people has he found, what passport, what ticket, what philosophy, what religious faith has he found that takes him out to the roads and the trails again? 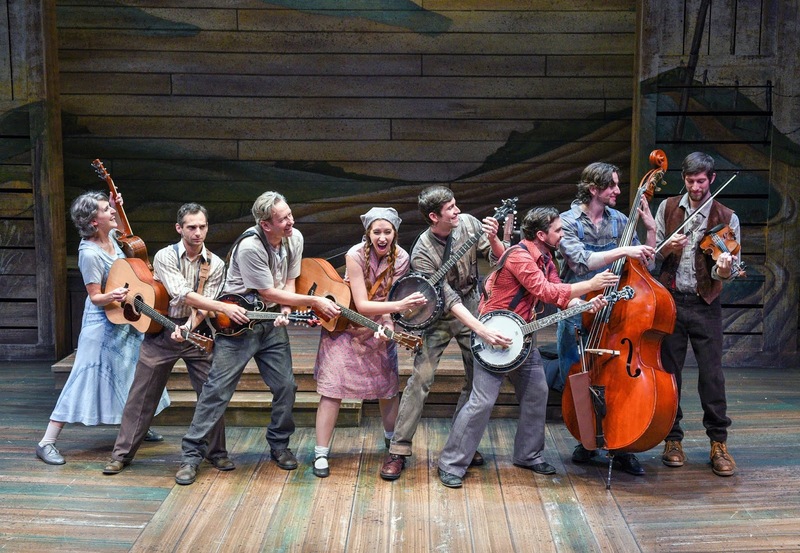 The words morph into one of Woody’s most famous ballads which summarize the travelogue basis of the show and the hardships of those years, the entire cast singing “Hard Travelin’” with exquisite harmony. The stage is now set to trace Woody’s life. Representing Guthrie earlier in life is Jeff Raab also known as “the Searcher,” singing a lick of the touching dust bowl ballad / waltz ” “So Long, It’s Been Good to Know Yuh,” and then a reprise of “Oklahoma Hills.” This culminates in the song “Dust Bowl Disaster.” Later in the show he is “Cisco.”. He has a fine voice and plays the guitar, banjo, and harmonica. One of Guthrie’s best known songs “Bound for Glory” is sung by the entire cast on a freight train with a hobo and “cripple Whitey.” The train is bound for the “glory” of California and is amusingly choreographed as the actors are singing as the train is moving at 60 mph. At the California line the rousing and ironic “Do Re Mi” (what you had to have to get into California) is sung by the five actors with gusto. One of the two women in the show is Cat Greenfield who comes from a blue grass background and cabaret theatre, exhibiting a fine, commanding soprano voice, as well as playing the guitar, banjo, mandolin, and the spoons (yes, the spoons, a real hoot). PBD veteran Julie Rowe also triumphs in a number of roles, giving heart tugging renditions of some songs and comic turns in others (she makes a great saloon singer later in the show). They both add a harmonizing poignancy to other songs, “Ain’t Gonna Be Treated This Way,” “End of My Line,” and ”Grand Coulee Dam,” culminating in the moving “Pastures of Plenty” at the end of Act I. The second act brings the musical to another level. 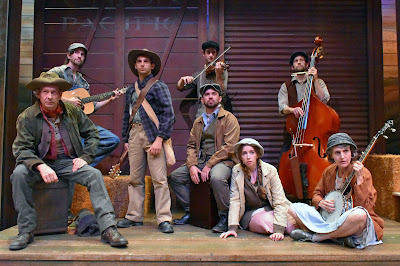 While “Grand Coulee Dam” was the employment they sought, Act II opens with the dark “Ludlow Massacre” which is about a miner’s union strike during which 13 children were killed by National Guardsmen, Greenfield and Rowe carrying the leads with the imaginative and effective playing of the instruments in percussion, its military rhythm driving the song forward. The “kid” introduces him to New York, and its saloon halls, his next stop in his ramblin’ life, amusingly singing “New York Town” together, vying with one another for sidewalk tips. They strike up a friendship with Cisco offering a line that could summarize the show: As long as we've got wrecks, disasters, floods, trade union troubles, high prices and low pay and politicians, folk songs are on their way in. Now we come to the tragic story of the Reuben James, the first military vessel sunk by the Germans in WW II (Guthrie served in the Merchant Marines). The folksinger explains that the sinking happened before Pearl Harbor by a German U-Boat. He goes on to say I can't invent the news but I do my job, which is to fix the day's news up to where you can sing it. A roar of laughter came forth from the audience, acknowledging that in this respect times have changed. But not all that much. Here the show transitions to the mature Guthrie as “the writer” played by Don Noble. Noble is a veteran of Broadway with a commanding bass voice, and comes to the show with guitar and mandolin skills as well. Among other songs, he introduces what, to me is the show stopper, perhaps the most moving Guthrie folksong, “Deportee” and as explained, A chartered Immigration Service plane crashed and burned in West Fresno County this morning, killing 28 Mexican deportees, the crew and an immigration guard. The “deportees” were illegal immigrants and the song is about their stark anonymity to history and an indifference to them as human beings. The song itself is sung primarily by Cat Greenfield, silhouetted by a spotlight, with the cast joining in. The parallels to our time are unmistakable with barely a dry eye in the audience. From the lyrics: Some of us are illegal, and some are not wanted, / Our work contract's out and we have to move on; / Six hundred miles to that Mexican border,/ They chase us like outlaws, like rustlers, like thieves….We died in your hills, we died in your deserts,/ We died in your valleys and died on your plains. / We died 'neath your trees and we died in your bushes, / Both sides of the river, we died just the same. The song’s Chorus, heartbreaking, devastating…Goodbye to my Juan, goodbye, Rosalita, / Adios mis amigos, Jesus y Maria; / You won't have your names when you ride the big airplane, / All they will call you will be "deportees". The show gathers momentum to a happier conclusion, with “Better World”, and the iconic “This Land Is Your Land.” There are many comic moments too, one of which Director Linser has the cast singing a lick of song, lined in a row facing the audience with their steel stringed instruments, one hand working the frets and the other strumming the strings of the musician next to him or her! A crowd pleaser. Scenic Design by Michael Amico was influenced by the American painter and muralist, Thomas Hart Benton whose work focused on the mid West. He was able to transfer the sense of Benton’s color and movement to a barn siding, depicting Guthrie’s “journey” from west to east. This gave Costume Designer Brian O’Keefe colors to work with and as the journey takes place over a lifetime, multiple costumes for the characters, adding still another layer to the production. The costumes reflect the threadbare realism of the characters' hard times and their regionalism. This is a feel good musical, filled with both pain and joy. As the show ends with his most easily recognizable “This Land Is Your Land" you’ll find yourself emerging from the theatre savoring the words or singing them out loud as the audience did last night, celebrating what it means to live here in this great land, even perhaps with a sense of optimism in the headwinds of history and our times.